టయోటా ఫార్చ్యూనర్ 7 వేర్వేరు రంగులలో అందుబాటులో ఉంది - ఫాంటమ్ Brown, Avant garde bronze, White Pearl Crystal Shine, Super white, Attitude Black, Grey Metallic, Silver Metallic. Toyota’s claimed fuel efficiency figure for the Fortuner is 14.2kmpl. How much does it deliver in the real world? Amazing look with awesome performance. Tough build, Toyota body-on-frame SUVs are known to have very long lives. Fortuner is an excellent SUV as it has best in class cabin space. It has a brilliant interior and exterior. A nice car. I like it very much. Comfort to drive. Nice look when it gets modified. Good for offroad purpose. I Bought two cars and it had good features and if we talk about money matters, Fortuner has worth price comparing to its features, space& comfort. 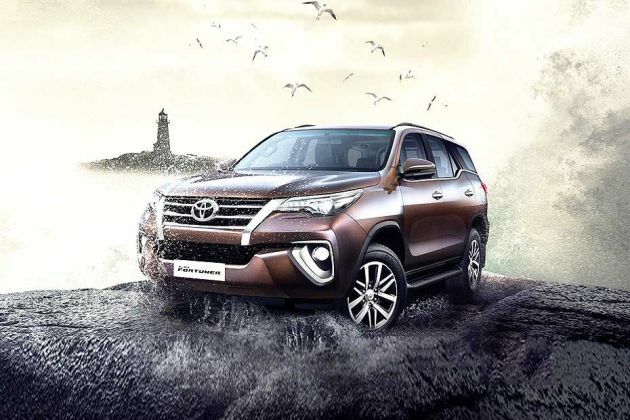 Toyota Fortuner is car with fun and style with unique performance. Amazing Car with Great features and royal look. if we will talk about highways I found it more smooth to drive. టయోటా ఫార్చ్యూనర్ - దీని ప్రజాదరణకి కారణం ఏది ? ఎన్నో చిత్రాలను రహస్యంగా తీసినప్పటికి, టయోటా 2016 ఫార్చ్యూనర్ ను అధికారికంగా బహిర్గతం చేయనుంది. అంతేకాకుండా రానున్న 2015 ఫోర్డ్ ఎండీవర్ తో గట్టి పోటీ ను ఇవ్వడానికి రాబోతుంది.